So I had gotten these pants back in September, first off Im a dummy who bought them in a size medium, ripped off the tags, threw the receipt away and lo & behold I needed a size small. Does anyone else HATE themselves when they do that? Anyways, I ended up just hanging them in my closet and finally picked them up the other day and told myself that I would make it work! Im slowly coming into my own style, truth is I see all these beautiful super trendy women on Instagram and I admire you all, and hey at times I get inspired off of it. But, my true style is so classic. I LOVE buying pieces that I believe Ill be able to keep for so many years to come. A few “out there” pieces are a must but for the most part Im just a classic gal. 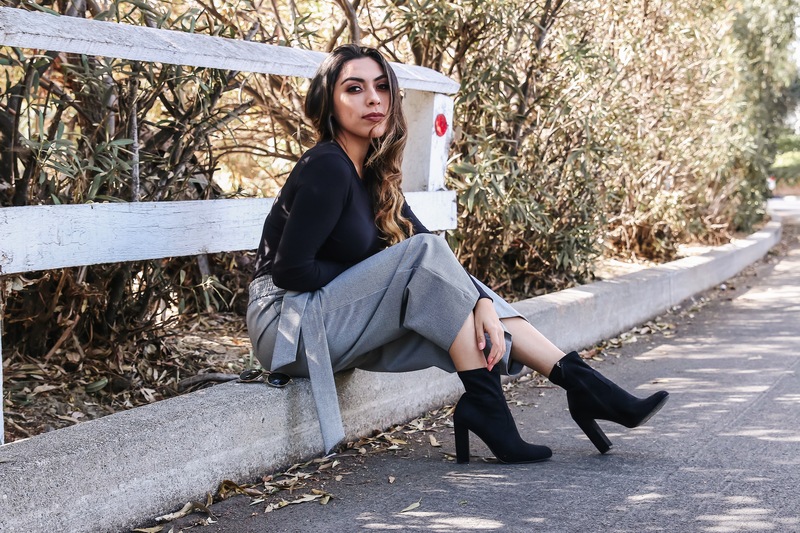 Thats when I simply had to stop overthinking the outfit and go with a simple black long sleeve and my black booties that Ive worn may many times. The look is easy, classic but trust me when you wear pants that make a BANG statement, people take notice. Thats what happened this day, my whole day revolved around ladies complimenting the pants. So see, sometimes going simple and having one pop out item makes a difference. okay so another fun fact, no lie, Leslie my girl who helped me shoot these looks caught me right in the moment where the most beautiful shirtless man was going for his casual jog around the neighborhood that I just had to take off my sunglasses and admire with a better look ahaha. I mean, just keeping it real haha. Since my pants are not on Zara’s website anymore I went ahead and searched the internet for 4 of my favorite ones at prices that I would pay which means none of them will be insanely expensive because I just wouldn’t do that to you, or me haha. Why look if you can’t buy you know? Look through them all, pick your favorite, buy it and add it to your closet because they really can be styled to go to an interview, a girls night, date night or work! That for me is the perfect closet staple. Enjoy!